The M.V. 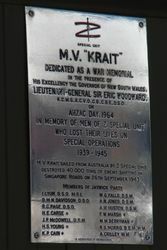 "Krait" was dedicated as a war memorial in memory of the men from Z Special Unit who lost their lives on Special Operations during World War Two. The Australian War Memorial owns the vessel which is on permant loan to the Australian National Museum. 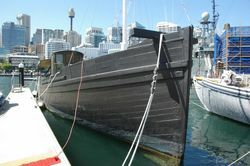 The 21-metre, 60-tonne former Japanese fishing vessel carried 14 members of the top-secret World War 2 `Z' Special Unit from Australia to Singapore in September 1943 where they sank 40,000 tonnes of enemy shipping anchored in the busy Japanese occupied waterway. Operation Jaywick is regarded as one of the most brilliant special-forces operations in history and the Krait, named after a small but deadly Asian snake, is credited with sinking more enemy shipping than any Australian warship. Six of the 14 raiders, led by Major Ivan Lyon, paddled 50km into the harbour in two-man kayaks to attach limpet mines onto the sides of several Japanese ships. The Japanese were taken completely by surprise and they assumed that the raid was organised locally so they tortured hundreds of people and murdered 70 on October 10, 1943 in what has become known as the double tenth massacre. Six of the Jaywick men were executed by the Japanese following a botched raid on Singapore codenamed Rimau in September 1944. 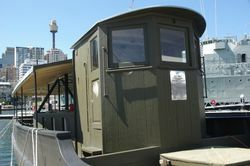 Note : As of 2013, there are plans to have the vessel restored and be displayed in a custom-built expansion to the Maritime Museum's Wharf 7 building.